In 1865 Sheriff Bhai Jiwa Surti at a young age of 18 travelled to Zanzibar from India and worked in the famous Nasser Nurmuhamad’s branch in Nosibe. (Madagascar). Due to his hard work, loyalty, sincerity and generosity he was well respected within the city and by his employer. In 1885 he went to Bhavnagar to get married and returned to Nosibe with his spouse. After staying for a short period he then went to Diegoswarez to start his own business. There were only 2 Ithnasheri families living in Diegoswarez namely Bachoo Bhai Hasham and Molu Kanji Bhai. Shariff Bhai was a staunch Shia. 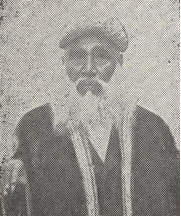 The religious activities in Madagascar were not being actively undertaken at the time, so he used to increase his religious knowledge by communicating regularly with Alama Haji Gulamali Esmail (Haji Naji). Due to his business principles and sincerity he became famous thus all the French Army contracts were given to him. In Zanzibar there cropped up a long misunderstanding between the community members and many people tried to intervene and resolve the problem but in vain, finally in 1908 Shariff bhai went to Zanzibar and because of his wisdom, he succeeded in resolving the long time misunderstanding. All the members were satisfied by his wise decision.In appreciation of his services the Zanzibar Jamaat awarded him a token of appreciation in a silver casket. (The photocopy of the same has been reproduced herein). Sharifff bhai was very generous, frank and used to host guests of other communities too. The religious scholars as well as any other community members would be hosted by Shariff bhai at his home. The good qualities he possessed and his attributes earned him a renowned name of “Bapa Shariff”. The land on which the masjid and imambarghah of Diegoswarez were built was donated by Shariff bhai as “Waqf”. The wonderful market through which the Government benefitted is the generous donation of Shariff bhai. He had built it personally and after the 30 years’ lease expired, he gave away the land as well as what was built on it to the Government. Shariff bhai’s generosity did not stop here; he contributed far and wide in different towns, cities and countries. He was being mentioned and appreciated every now and again in the local papers. He also used to receive letters regularly from abroad for the generous contributions he extended. There were many instances whereby Haji Shariff Jiwa of Mombasa used to receive many appreciation letters erroneously from abroad which he used to forward them to Shariff bhai Jiwa Surti. He passed away peacefully leaving behind a widow, four sons and four daughters, Shariff bhai departed from this world leaving behind a legacy which shall be remembered for long time. Huge number of residents of Diegoswarez participated in the funeral ceremony of late Shariffbhai and expressed their condolences to the family for the loss of such a sincere, generous and a pious person. Since 1925 the eldest son of Shariffbhai, Gulamhusseinbhai had been doing business in Majunga, the second son Hashamalibhai is running his business in “Annawalla,” Muhammadalibhai in “Anchui” and the fourth son Ismailbhai is settled in Majunga. Shariffbhai’s eldest daughter was married to the famous Fazalbhai Chinnai, the second daughter Kulsumbai married to Abidbhai of Tuleyaar, the 3rd daughter Rehmatbai is the wife of one of the businessman of Majunga Brother Kassamali Mohamadali and the fourth daughter Fatmabai is the wife of Jafferali Muhammadali Chinnai of Tananarive. Today we feel very proud to re produce this article to the members of our community worldwide so that we all can learn from these great leaders and elders of our community, the community that had established deep roots, religion and infrastructures in many parts of Africa, it is an eye opener for the new generations who enjoy the fruits of their forefathers.